Speed is usually a key factor of performance. With a line speed of up to 200 m/min, the loose tubes are stranded at an impressive 2,500 rpm. But speed alone does not fulfill all the requirements a manufacturer has for a production line. Integrated components also have to react precisely at high speeds. New materials and optimizations of cable designs in terms of compactness, number of fibers, material consumption and production costs constantly pose new challenges for cable manufacturers. A few years ago, a loose tube with 12 fibers had a diameter of 2.8 mm. Today, the same loose tube has a diameter of only 1.4 mm. Low binding forces are a quality criterion when stranding such cores and additionally supporting the product characteristics. Tensions of 2 Newtons and less! 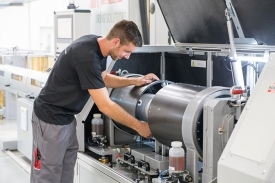 The newly developed yarn tension binder from Rosendahl with integrated yarn tension measurement enables minimum yarn tensions of 2 newtons, which cannot be achieved using conventional binders. These constant tension forces contribute to optimum results in fiber optic productions and minimize scrap.